What do people think about you after meeting you for the first time? After spending an afternoon with you? After doing business with you? Do you leave a lasting impression? What do you want them to think? What is YOUR personal brand…? Personal branding is, to put it simply, how you market yourself to your audiences. Your brand can be driven by your occupation, your passions, your personality, or a blend of all the above. Oftentimes we have a personal brand without putting any effort towards creating it. Intentionally developing and maintaining your brand requires a great deal of thought and dedication, along with consistency throughout all social and professional outlets. In order to create and establish your personal brand, it is necessary to start thinking of yourself as a brand. Makes sense, right? But, as stated in an article on Forbes, this doesn’t mean that you are now just a product. You must still be authentically human while consciously thinking about what you want people to associate with your name – whether it be a personality trait, a product, subject expertise, etc. So why put in the time and effort in to developing a personal brand if you can unintentionally have one anyway? As this article in Fast Company supports, a well-developed personal brand correlates to personal success. The effort you put in to creating and maintaining your brand drives you to deliver work that meets higher standards. The effort also places you in a high caliber category by potential employers and colleagues. You identify yourself as a thought-leader and set yourself apart from others with the same basic degrees and work experience. Your personal brand is your differentiator. Your personal brand is also your story. This will resonate with us marketers. Your brand must be dynamic to keep up with the ever-shifting landscape that we call life. Your career may change, your lifestyle may change, your geography may change – and with that, your brand may need to adapt. Your brand must connect the changes in your life. 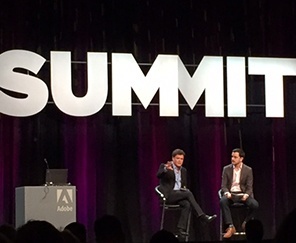 The 2016 Adobe Summit event in Las Vegas, NV featured George Clooney, Abby Wambach, and Donnie Osmond. The major underlying theme? Reinventing yourself and your personal brand. Clooney, a long-time “big-name” in the acting world focused on keeping it fresh. Abby Wambach, a now retired Olympian and soccer hero discussed taking the next step in her career… away from the field. Donny Osmond, once solely an entertainer, and now a man known for many talents spoke about being dynamic. All three spoke about your personal brand being a continuous dialogue and the importance of reinventing yourself every once in a while. So, tell your story; start your dialogue and create your personal brand.